Revised Feb. 10, 2018, to reflect latest safety rating. Hyundai’s largest SUV in Ultimate form. The 2018 Hyundai Santa Fe competes in the midsize, three-row SUV segment. Hyundai is just a few months away from welcoming a fourth SUV to its product line, the subcompact Kona. And it can’t come soon enough. Indeed, with sales of its compact Tucson up 26.8 percent year-to-date through September, strongly suggesting another small model would be well received. As for its larger SUV models, the Santa Fe and Santa Fe Sport, Hyundai counts those sales together. U.S. sales are actually down 2.7 percent through the first nine months as competitors such as the Dodge Durango and the Honda Pilot have also experienced a slight pull back in a highly competitive segment. Following a major overhaul in 2017, the 2018 Santa Fe is a carried over. Hyundai offers the 2018 Santa Fe in three trims: SE ($30,850), SE Ultimate ($38,850), and Limited Ultimate ($39,550). Add $950 for the destination fee and $1,750 for all-wheel drive. Both Ultimate models offer a $2,100 Tech Package, bringing in such features as smart cruise control with automatic stop/start, automatic emergency detection with pedestrian detection, lane departure warning, an electronic parking brake with automatic vehicle hold, high intensity discharge headlights, dynamic bending lights, and high beam assist. Fully optioned, your final price will come in at $44,350. And that was sticker price of my front-wheel drive ride for the week. 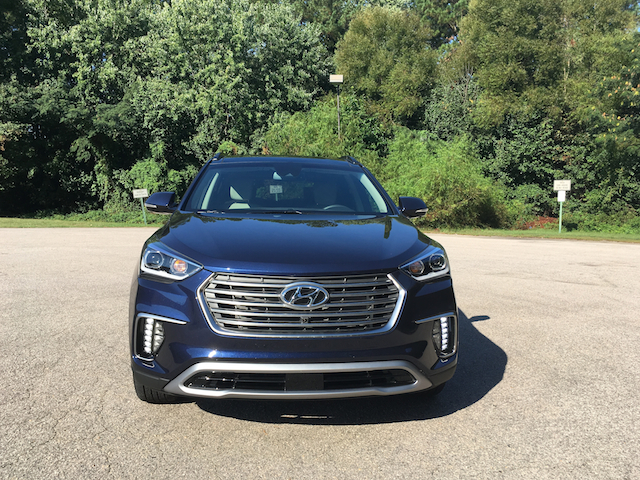 The 2018 Santa Fe offers a look that is at once sporty as it is upscale. Flared headlamps, a gaping upper grille and a chrome-trimmed lower grille are among the standout touches. 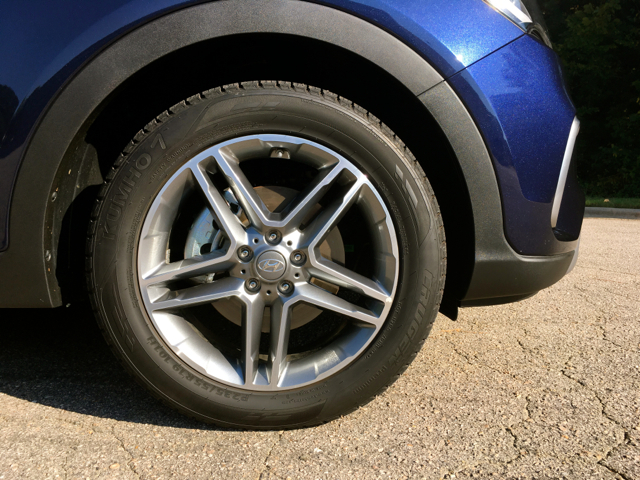 Hyundai brings its own style to what otherwise is a nondescript profile with distinct profile lines and sculpting. 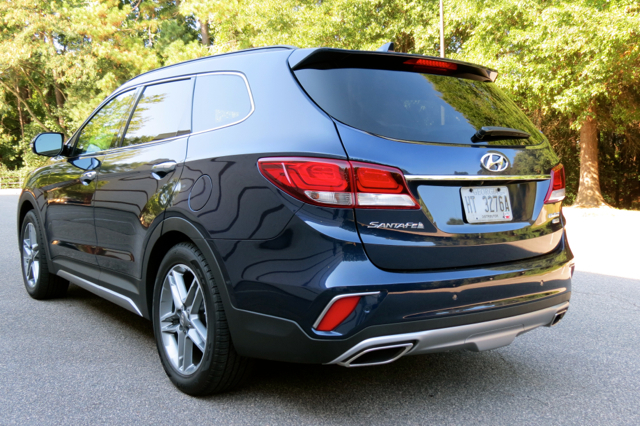 From the rear you’ll find a liftgate spoiler, wraparound combination lamps, and chrome trim. Standard features include LED daytime running lights, heated dual power side mirrors, roof side rails, a chrome dual-outlet exhaust, and 18-inch alloy wheels. Available features include front LED fog lights, dual-power side mirrors with turn-signal indicators, 19-inch alloy wheels, a hands-free liftgate with automatic open, and premium sill plates. With the top trim, you’ll find HID headlights with dynamic bending light and LED taillights, and a panoramic sunroof. 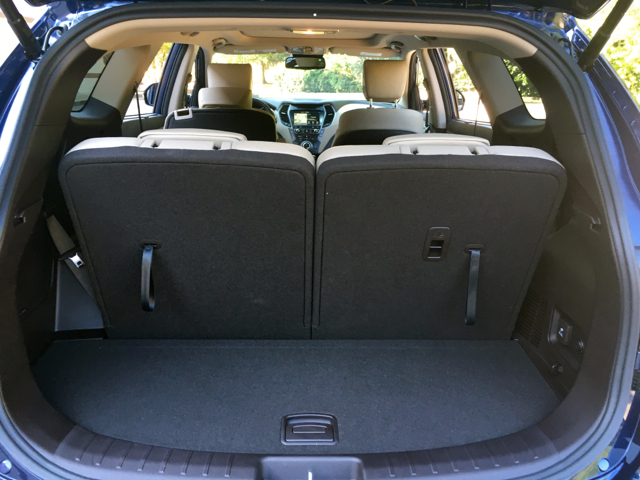 Midsize, three-row crossover utility vehicles are generally roomy, although third-row seating space may sometimes prove tight, depending on the model. 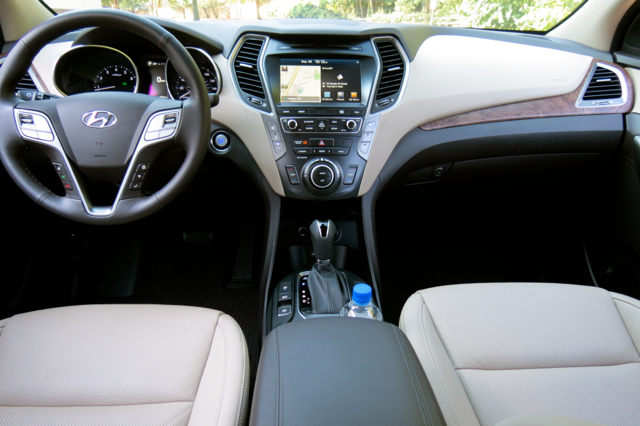 The Santa Fe has the expected room along with a clean interior dressed in soft touch materials. Two-tone touches on the dashboard and door panels along with woodgrain trim on the dash give this model a premium vibe. You’ll find some plastics present as well, disguised as metallic trim on the steering wheel, vent and instrument gauge surrounds and the door panels. 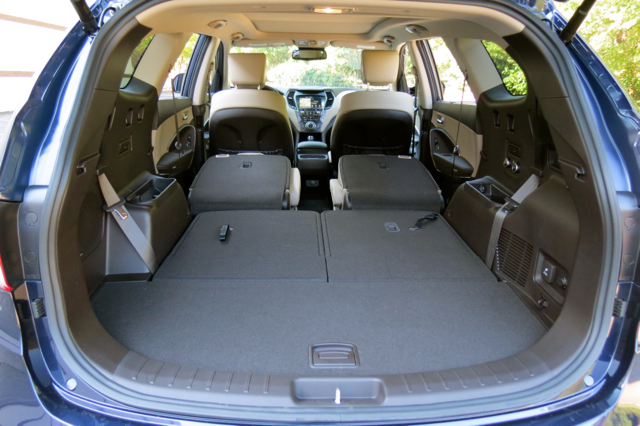 Standard features include full power accessories, 7-passenger seating with cloth seats, an 8-way power driver’s seat with 4-way lumbar support, sliding second-to seats with cargo-area releases, and rear seat ventilation. Available features include an electroluminescent gauge cluster, heated leather-wrapped steering wheel, heated and ventilated front seats, leather seats, a power passenger seat with height adjustment, an automatic dimming rear mirror, and manual rear side window sunshades. 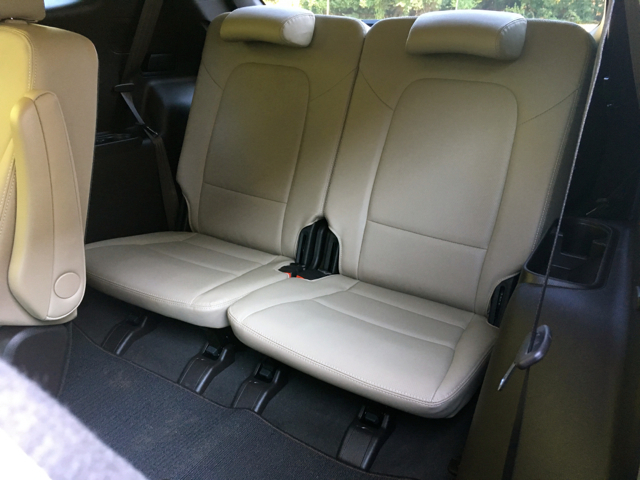 My test model came with six seats and there is a very good reason to want this feature: third-row legroom improves significantly, especially if a passenger desires to stick his leg out between the two middle-row captains’ chairs. 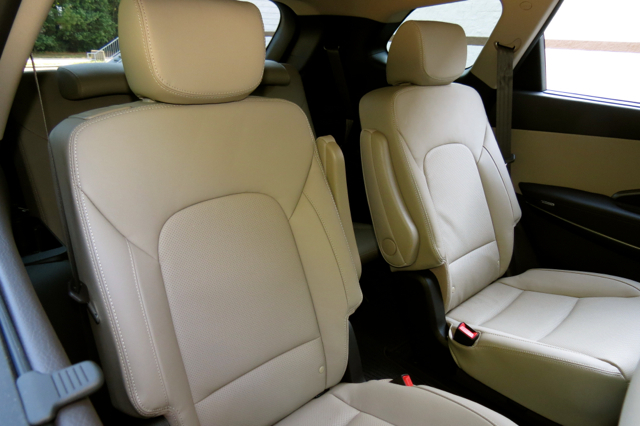 The third-row isn’t a fan favorite as the seats have thinner padding — the better to fold down when needed. That said, the six-seat arrangement is the ideal one when carrying six adults. The middle seat passengers will thank you as they gain heated seats, armrests and cup holders, not to mention vent controls. Given that the 2018 Santa Fe is a carryover and the 2017 model achieved the Insurance Institute for Highway Safety’s (IIHS) Top Safety Pick+ rating, the score is likely a carryover too. 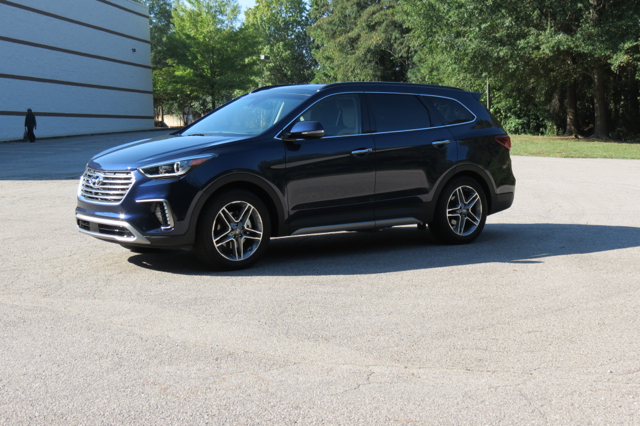 The National Highway Traffic Safety Administration (NHTSA) hasn’t graded the Santa Fe at all since its 2017 update. 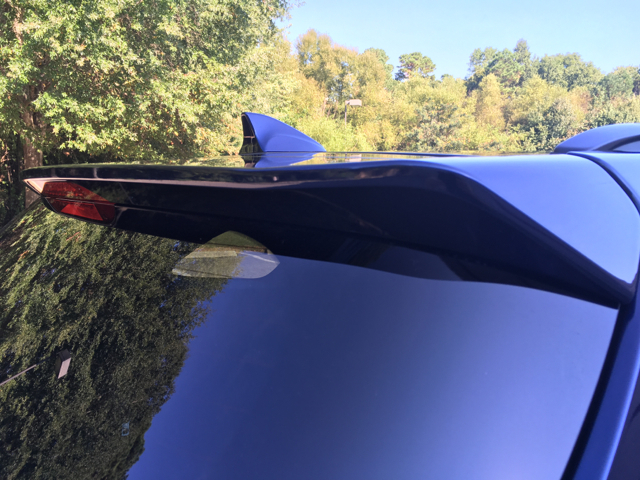 The base model comes with a rearview camera. 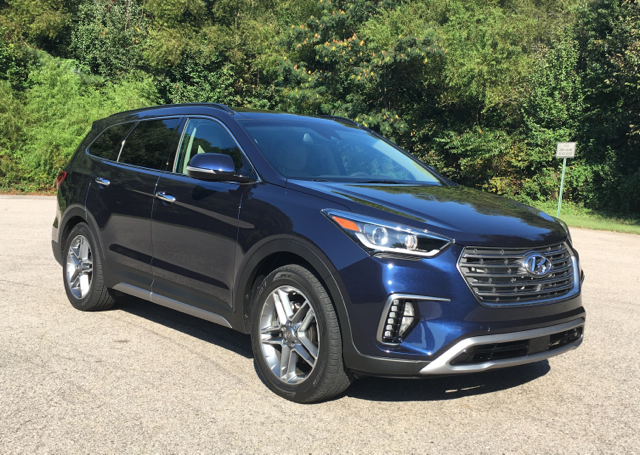 You’ll find a multi-view camera system on the two other trims, what features four cameras strategically placed around the vehicle to render a 360-degree view of the Santa Fe’s surroundings. Standard features include downhill brake control, hill start assist control, and a driver’s knee airbag. Blind spot detection, rear cross-traffic alert, and rear parking sensors come with the middle trim. Fully optioned, this model delivers lane departure warning, smart cruise control, automatic emergency braking with pedestrian detection, high beam assist, and dynamic bending light technology — what expands night time views accordingly, enabling you to view eye shine before its too late. Besides the safety technologies mentioned in the previous paragraph, you’ll find a host of technologies across the model line. 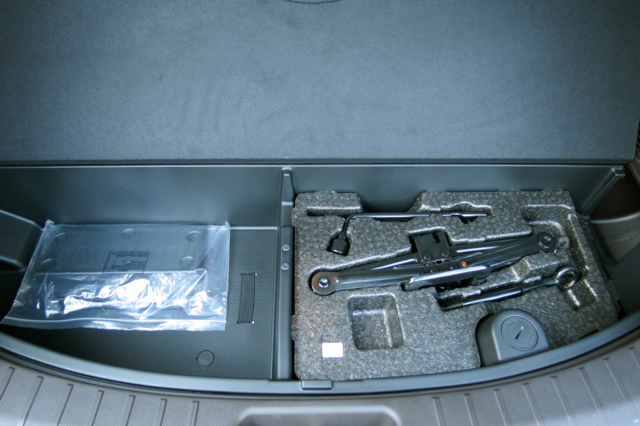 All models come with Hyundai’s Blue Link connected car system, what provides app access to the vehicle. Blue Link enables owners to lock and unlock their car doors, start or stop the engine, control the lights, and sound the horn or turn it off. It also provides a vehicle status report, all from the ease of your smartphone. Other standard features include Bluetooth connectivity, Apple CarPlay and Android Auto compatibility, USB ports and an auxiliary audio input, and an audio system with a CD player, HD Radio, and satellite radio. A 7-inch color touchscreen display and six speakers come standard. 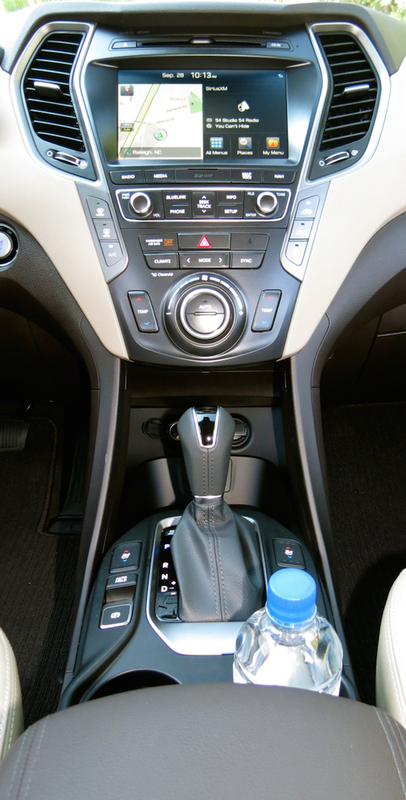 You can also upgrade to an Infinity sound system and an 8-in touchscreen display with navigation. Crossovers are big on delivering ride comfort, adequate power, utility and towing capabilities. Some models do it better than others — the Santa Fe keeps pace with the best of them. All models have a 3.3-liter V6 engine with 290 horsepower and 252 pound-feet of torque, a six-speed automatic transmission, and standard front-wheel drive. Available all-wheel drive, a 5,000-pound towing capacity, and a multi-link suspension system with a stabilizer bar are additional attributes. The Santa Fe provides clear sight lines, a comfortable ride and generous acceleration. Press on the gas pedal and you’ll find ample power for picking up speed on a highway entrance ramp or while passing on a freeway. That said, if you opt for the front-wheel drive model as tested, expect some torque steer from time-to-time, especially if you decide to floor it. All-wheel drive largely mitigates that feeling, but at an added cost. The transmission works seamlessly in the background, although I did wonder why Hyundai has yet to upgrade to an eight-speed unit, essentially the standard for 2018 models. That said, the Santa Fe checks off all the requirements in this segment. There is a big price jump between the base SE and the next level SE Ultimate, $8,000 to be exact. For another $700 you’ll reach the Limited Ultimate. If you choose the base model, you can add a Premium Package ($3,650), adding such driver assist features as blind-spot detection and rear cross-traffic alert and lane change assist. You’ll also find front LED fog lights, dual power side-mirrors with turn signal indicators, a hands-free liftgate, keyless entry with push-button start, a leather interior, and other touches. 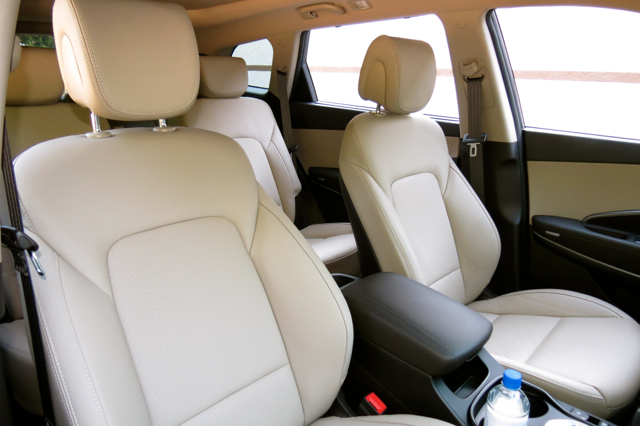 Put it all together and you’ll come away with a roomy, comfortable and stylish SUV for about $35,000. 2018 Hyundai Santa Fe photos copyright Auto Trends Magazine. All rights reserved.